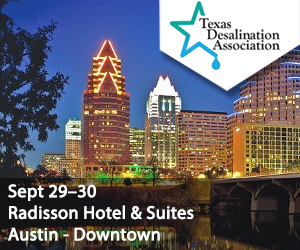 Save the Date for Texas Desal’s 4th annual conference. Hear from Texas legislative and municipal leaders, industry professionals and a host of technological innovators. Connect with more than 300 people from across the country and around the world including: water planners, public water suppliers and utility managers, representatives from federal, state and municipal governments, consultants, engineers, project developers, hydrogeologists, technology experts and vendors, and stakeholders from the oil & gas, agricultural, environmental and industrial sectors.